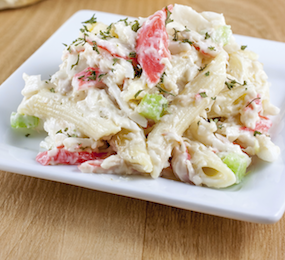 The Seafood Pasta Salad recipe is a favorite from my catering days. A gift from my neighbor Caryn who often shares recipes with me that are notable for their easy style and refreshing flavor-just like her! This budget wise recipe serves so many people that I like to include it in the first course of a Shabbat meal. 1. In a large bowl, toss pasta with fish, celery and onions. 2. In a separate bowl whisk together the dressing ingredients. Pour half of the dressing over pasta mixture, mix well and season to taste with salt and pepper. Cover and refrigerate until ready to serve. 3. Just before serving, pour the rest of the dressing over the salad and toss well.